As interest grows in Bernie Sanders’ “revolutionary” agenda following his strong showing against Hillary Clinton in the Democratic Iowa caucuses, a new study warns that the Vermont senator’s plan for universal government health care coverage could add as much as $14 trillion to the national debt over the coming decade -- even with enactment of the massive tax hikes that Sanders has outlined. Sanders favors replacing current federal health care programs, including the Affordable Care Act, with a single-payer “Medicare for all” program. He said it would assure all Americans full medical and prescription drug coverage and reduce the annual cost to consumers by eliminating the need to purchase private health insurance policies with ever-mounting premiums and co-payments. “Bernie’s plan will cover the entire continuum of health care, from inpatient to outpatient care; preventive to emergency care; primary care to specialty care, including long-term and palliative care; vision, hearing and oral health care; mental health and substance abuse services; as well as prescription medications, medical equipment, supplies, diagnostics and treatments,” according to Sanders’ campaign website. However, even with the adoption of the trillions of dollars in higher taxes Sanders has proposed to offset the cost of his national health care program, a new study by the Committee for a Responsible Federal Budget found that the net cost to the federal government would skyrocket, and could potentially drive up the national debt by 100 percent to 150 percent of the Gross Domestic Product by 2026. While the watchdog group applauded the self-described socialist who is not a member of the Democratic Party for attempting to match his health care proposals with increased tax revenues, the report warns that the overall cost to the government for would far exceed the tax revenue collected. Sanders’ claims his single-payer program, which he says is similar to national health programs in Canada and Europe, would cost the government an additional $1.4 trillion a year – or $14 trillion over the coming decade. Those figures are based on computations by the University of Massachusetts-Amherst economist Gerald Friedman. The government’s costs would be offset with revenues from a combination of taxes on average workers, employers, investors, estates and the wealthiest earners. 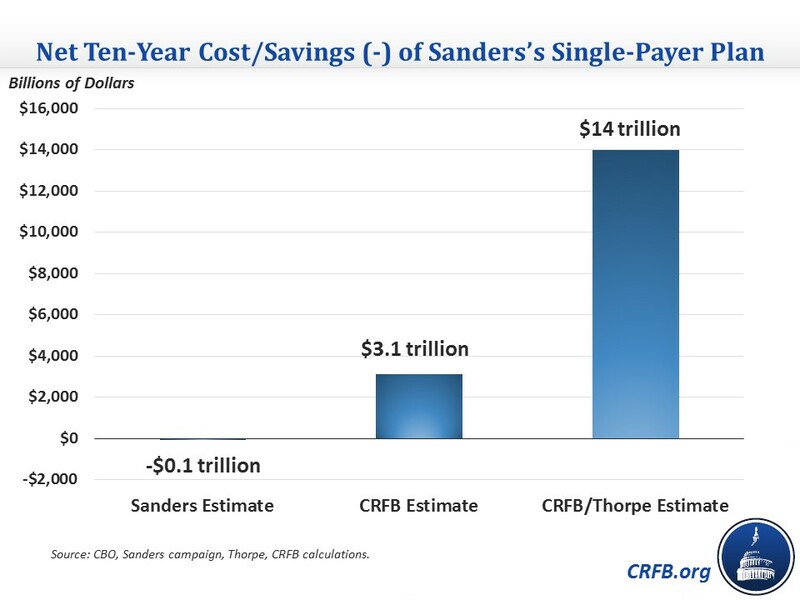 “However, by our rough estimates, [Sanders’] proposed offsets would cover only three quarters of his claimed cost, leaving a $3 trillion shortfall over ten years,” the CFRFB report states. The study also cites an alternate analysis by health economist Kenneth Thorpe of Emory University forecasting substantially higher government costs – or as much as $24.7 trillion over the coming decade. Thorpe and Friedman differ greatly over how much Sanders’ program would save in administrative costs, drug prices and other factors. As a result, Thorpe has projected a $14 trillion revenue shortfall for the government through 2026. What’s more, Sanders’ proposal would increase the top tax rate “beyond the point where most economists believe it could continue generating more revenue,” according to the CFRFB report. As a result, Sanders’ approach would produce even larger deficits as result of slowed economic growth. Other studies say much the same. A new analysis of Sanders’s tax proposals by the non-partisan Tax Foundation concluded that they would raise tax revenue by $13.6 trillion over the coming decade, using standard methods for measuring the effect. However, because Sanders’ fiscal policies likely would discourage or slow economic growth and investment in the coming years, his tax proposals would ultimately collect only $9.8 trillion over the next ten years – far below the cost to the government of undertaking a single-payer health insurance program. Sanders has energized large numbers of liberals and young people with his calls for a massive buildup of government programs and proposals for revising the federal tax code that would hammer Wall Street, the “millionaire and billionaire class,” and the striving middle class. Some estimates have placed the total cost of Sanders’s social programs, including his single-pager plan—at $18 trillion over the coming decade. “I believe everyone should be entitled to health care as a right,” Sanders said recently at a town hall meeting in Iowa, claiming that his plan would “save middle class people thousands of dollars a year on their health care bills.” Sanders argued that it was unfair to criticize his proposed tax increases because millions of Americans would eventually see their higher taxes offset by elimination of the premiums on their current private health insurance policies.